The Ornish Diet has been named the “#1 best diet for heart disease” by U.S. News & World Report for seven consecutive years! Dr. Dean Ornish is the first clinician to offer documented proof that heart disease can be halted, or even reversed, simply by changing your lifestyle. Based on his internationally acclaimed scientific study, which has now been ongoing for years, Dr. Ornish's program has yielded amazing results. Participants reduced or discontinued medications; they learned how to lower high blood pressure; their chest pain diminished or disappeared; they felt more energetic, happy, and calm; they lost weight while eating more; and blockages in coronary arteries were actually reduced. 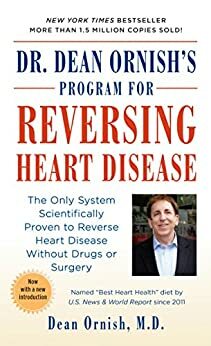 In his breakthrough book, Dr. Ornish presents this and other dramatic evidence and guides you, step-by-step, through the extraordinary Opening Your Heart program, which is winning landmark approval from America's health insurers. The program takes you beyond the purely physical side of health care to include the psychological, emotional and spiritual aspects so vital to healing. This book represents the best modern medicine has to offer. It can inspire you to open your heart to a longer, better, happier life. My husband and I used to eat relatively healthy. Bio-markets, occasionally vegan soups, we even bought an omega juicer. His cholesterol was hovering around 200 and below, LDL at about 100, and blood pressure was slightly high (135/85 or around that number.) We are in our 40s, athletic, no family history of heart disease, non-smokers. It was a shock to us when he started having chest pains, and was told he had 80% LAD blockage. The doctor was clearly not very tactful in the cath lab when he told me that it was called "the widowmaker." So he got a stent, started taking statins and anti-platelet, and we switched to Dr. Ornish (or Caldwell, or Esselstyn, or Pritkin... there are several proponents of similar plans with slight variations) diet. I got all the books and the recipes, and started the diet with him, since I cannot scarf down burgers while he eats carrots. His weight went from 175 to 155 lbs. Mine from 136 to 120. Before the diet I was trying to lose 5 lbs, to get to my happy weight of 130. The scale did not budge. Now, if I don't eat I keep losing weight, so I have to eat a lot, and often. His cholesterol went from 197 to 90, with an LDL of 20. That's not even human, in my opinion. Now he does take Lipitor (40 mg), so I am his "control group," since I take no medication. Mine went from 187 to 150, and LDL from 102 to 70. We asked the cardiologist whether he recommends this diet. He said yes, sure, if you can do it. He'd rather have people take their statins though, since the diet is so restrictive that few people stick with it long term. My husband's blood pressure went from 135/85 to 116/70, or something around there. We have a blood pressure machine now, so I can tell. (Can you tell I am doing this very scientifically.) I read all the articles I could find on pubmed.com and decided to supplement with B12 and Fish Oil of some high quality. The cardiologist said the fish oil makes no difference, but for now we take it. We also take Cardioviva, a probiotic which might have some benefits. It can't hurt anyway. We started eating fish a few weeks back, grilled or steamed, about twice a week, so we might stop the fish oil. That is the only concession we make to the diet. Is it hard? Yes, it is, especially since I am doing it just to support him. Can it be done? Absolutely. It only depends how scared you are, and how strong is your motivation. We exercised before, so we keep that up. I'd say the first three weeks were the worst, your body just can't figure where did all the dietary fat go. Then you adjust, and things that you took for granted start to taste amazing, especially the forbidden ones. I can tell immediately if something has peanuts, because I can TASTE THEM! But I cannot eat them, not part of the diet. There is a direct correlation between your LDL and the number of coronary and cardiac incidents. Below 50 LDL, none. So that's where we try to keep it, and I worry of course about the stent, and the anti-platelet medication, and about an asteroid hitting the Earth someday. That's just me. But the diet works, I feel healthier than ever, I can wear skirts I had stashed away 20 years ago (I found one in a box) and all my... mmm... systems work really well. We miss cheese, lobster rolls, fried clams, oysters... but you get used to it, and when you look at the benefits I think it is worth it. If we make it to 75, maybe we will stop and start eating whatever. 5.0 颗星，最多 5 颗星Life saver!!! This book saved my life! I was on both long lasting nitro and under the tongue nitro to stop my angina. Now I don't use either one. Three days after starting this diet I stopped having chest pain.....3 DAYS!!!! This book is a life saver!!! 5.0 颗星，最多 5 颗星A GREAT BOOK! I loved this book. It's been out for a long time but I recently had it recommended to me, and I'm very glad I read it. I always thought Dr. Ornish's program was just about a restrictive diet and stress reduction, but it's so much more. His program is very holistic, and he just describes what he has to offer and lets you pick what applies to you. Reading about his research is also very interesting; this was back when not much research was being done in this field. Very interesting book. Ties together three Spects of health: food, exercise, and psychology. The course is not difficult, per se, but if you try it you will see how actively resistant your environment (friends and family) are to changes and how much they contribute to your situation.